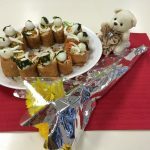 Have you ever made yubuchobap? It’s fried and marinated tofu stuffed with seasoned rice. The tofu tastes sweet, soft, and juicy, and the rice is vinegared: it’s a very unique combination, and even a little meaty! It’s very simple to make, and very popular in Korea. We usually make yubuchopbap from inexpensive readymade kits, but the real key to this dish is the properly-made fluffy rice with firm yet pliant grains. I originally posted this recipe in 2010, but I decided to remake the video this year because of an important discovery I made! I found that using my 1 tablespoon cookie dough scoop to make rice balls to fill the pockets is much easier, simpler, cleaner, and faster than the conventional method of squeezing rice with my hands. Ever since I discovered this, I make yubuchobap very often and I really wanted to share this with you. Yubuchobap makes for a great lunch menu, especially when paired with something like a salad. Now that springtime is here, it’s something quick you can make for a picnic on a sunny day. Enjoy the recipe and let me know if you try it! Open the yubuchobap kit and find 3 packets: a packet of seasoned tofu (aka yubu), a packet of dried ingredients, and a packet of vinegared sauce. Put the warm rice into a large shallow bowl. Mix in the packet of vinegared sauce little by little until it gets how you like it. A full packet is often too strong for me, I often use three-quarters of it. Open the packet of seasoned tofu and squeeze out any excess liquid. Take out the tofu pieces one by one and open them up. Put them on a platter. Open the mix of dried ingredients and put them on another corner of the platter. 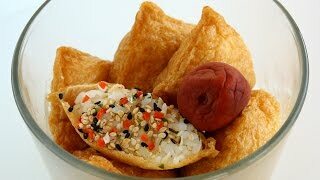 Make a rice ball with a cookie dough scoop and put it in a tofu pouch. 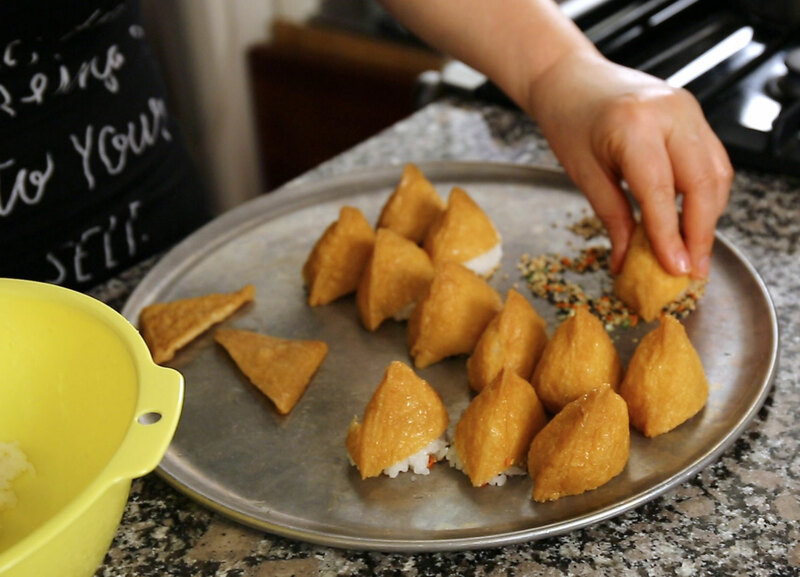 If you don’t have a cookie dough scoop, just use your hands by forming about 2 tablespoons of rice into a slightly oval ball, then put it into a tofu pouch. Fill the pouch so much that it can’t close, and the pouch opening exposes the rice inside. Dip the exposed rice into the dried ingredients, and put the yubuchobap on a plate. Repeat it with a rest of tofu pockets until all of them are full of rice and seasoned. Serve right away or put them into your lunch box. It’ll be safe to eat up to several hours at room temperature. Posted on Saturday, October 16th, 2010 at 11:17 am. Last updated on April 9, 2017. Posted August 23rd, 2015 at 4:12 am | Log in to reply. Hi Maangchi!!! I used this recipe for my home econs exam and i got an A!!!! Thank you for sharing this recipe!!!! Posted November 21st, 2013 at 6:38 pm | Log in to reply. Looks so yummy! I was wondering however, if I have left overs, will it taste good the next day for lunch? Or is it better to keep the empty tofu pockets in a bag for another day? Posted November 22nd, 2013 at 10:24 am | Log in to reply. “is it better to keep the empty tofu pockets in a bag for another day?” yes, it is. Make it with freshly made rice. Posted November 22nd, 2013 at 8:09 pm | Log in to reply. Posted November 22nd, 2013 at 11:24 pm | Log in to reply. haha, you didn’t leave any leftover! Posted August 23rd, 2013 at 1:25 am | Log in to reply. Posted May 30th, 2013 at 3:12 am | Log in to reply. I wonder if there any appropriate substitute for cucumber, because I had an allergic on it.. Any idea?? Posted May 30th, 2013 at 1:13 pm | Log in to reply. How about chopped spinach? Blanch some spinach and rinse it in cold water. Then squeeze out excess water.Chop it up and add a pinch of salt and mix. Then add to the rice. If this is too much work for you, just skip it. I use cucumber for color and crispy taste. Good luck! Posted August 25th, 2012 at 3:08 am | Log in to reply. 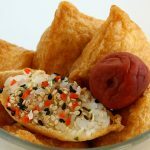 When I buy the tofu pockets, they do not come with the seasoning, What should I do? Do you have recipe for the seasoning powder and also the seasoning for the rice. Posted May 30th, 2013 at 1:15 pm | Log in to reply. You can make your own seasoning stuff. How about roasted sesame seeds and powdered kim (seaweed paper). You can add more delicious stuff like powdered dried shrimp. Posted April 10th, 2017 at 10:06 pm | Log in to reply. YES! This is exactly what I use, and it’s delicious. I grind my own kim and dried shrimp :) It’s delicious! Posted October 28th, 2011 at 12:45 am | Log in to reply. These look delicious! I’d love to give this a try, but I’m afraid no one would eat them. My mother can’t eat tofu or really any soy products due to medical issues, and my dad and sister really do not like tofu. At all. Posted June 26th, 2011 at 12:55 pm | Log in to reply. I didn’t realize that sticky rice would work best, I found this rice at a health food store here (in Korea) and I don’t really know what it is but I really like it! Posted March 26th, 2011 at 11:00 pm | Log in to reply. Hello… i liked the recipe… well.. dont want to look so dumb.. but… waa im from mexico and i would like to do this… the problem is i dont know how to cook rice… and i cant find a recipe where i could learn… korean rice.. waa.. hope you to help me… Thanks! Posted March 28th, 2011 at 7:02 am | Log in to reply. You will have to find short grain rice (known as sushi rice) though. Good luck! Posted May 4th, 2011 at 11:29 pm | Log in to reply. If cannot find short-grain rice (arroz), medium grain will work too. Growing up in Hawaii, my mom never did use short grain, always “calrose” medium grain. It was not until I moved to California (and started cooking on my own) I realized how many kinds of rice there are! Thank you Maangchi! I love your show. I made samgak kimbap today. Took me some searching to find the kit here in Portland Oregon! Posted February 22nd, 2011 at 11:56 am | Log in to reply. Posted May 29th, 2011 at 1:38 am | Log in to reply. Posted February 16th, 2011 at 12:20 am | Log in to reply. Posted February 16th, 2011 at 9:12 am | Log in to reply. This recipe was originally posted on October 16, 2010 at 11:17 am by Maangchi. It was last updated on April 9, 2017. The video was watched 456,241 times on YouTube & has 11,350 likes! This video is a remade version of an earlier recipe. The original video was posted on 2010-10-16 and has 357,602 views.